The Vinayapitaka, a sacred Buddhist text from 4th or 3rd c. BC. introducing the Dialogues of the Buddha, enumerates a list of activities from which the converted man should keep remote. Among this list are games and among them are Ashtapada, which means 8x8 gaming board, and Dasapada, which means 10x10 gaming board. Few times later, a Jain text, the Suyagadamga, says:"He should not learn [to play] the ashtapada-[game]". From this early times, Ashtapada was a dice game, and could then spoil the spirit of wise men and make them plunge into passion and violence. Perhaps, this is the reason why the rules have been lost. When, much more later, new games conquered India (6th c. AD. and beyond), the game of Ashtapada was completely forgotten and the word was only used to name the gaming board, for Nard (a Backgammon predecessor) as well as for Chess. For instance, Amarasimha's Amarakosa (6th or 7th c.) tells us that Nard was played over an ashtapada. Bana's Harshacharita (beg. 7th c.) does the same for Chess. Then, the word took other meaning and, finally, completely disappeared after the 12th c. It went out of History and no one really knows what is was exactly! In India, the chessboard is unicolor and presents somes cross-cut squares. These markings being similar to those found in modern spiral race games - like the Thaayam in Sri Lanka, H.J.R.Murray, the great Chess historian, made the hypothesis that Ashtapada was a spiral race game as well. 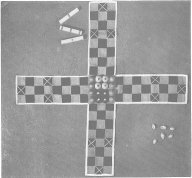 In his first book, A History of Chess (1913), he wrote the following (pp40-41): "The existing boad-games of this special type in Southern India and Ceylon are all played on boards with an odd number of squares, so that there is a single central square which serves as point of exit for all four players alike. 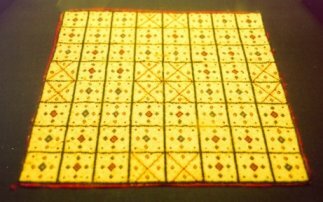 In Pachisi on the other hand, each player has his own point of exit, and there seems no reason why a similar arrangement should not have been tried upon a square board. In this case the square would obviously be one with an even number of points, and the four central points would serve as the four points of exit for the four players"
But Murray continued:"It is to this more complicated type of race-game that I assign the early Indian game on the ashtapada board. I find support for my belief in a peculiarity of the modern Indian chessboard which has no importance for chess and has never been explained in a satisfactory manner. On all native chessboards which I have seen, certain squares are cross-cut precisely as in the games of Pachisi and Gavalata.[...] The explanation of these cross-cut square is, I believe, to be found in the fact that the Indian chessboard is simply the old asthtapada board, and preserves its original features, although their purpose has long been forgotten. The Ashtapada game was, I believe, very similar to the modern Gavalata." So, in 1913, Murray proposed his belief, it was just his opinion. But everything changed when Murray published his second book A History of Board-games Other Than Chess (1951). Then, he wrote the following about Ashtapada (pp129-130):"The board contains 8x8 cells. It was on this board that the inventor of Chess arranged his game, and the Indian chess-board to this day preserves the crosscut cells of Ashtapada board although they play no part in Chess, and they have even survived the checkering of the board. [...] The invention of Chess did not interfere with the practice of the older race-game and both games continued to be played on the same board. [...] We only know how Ashtapada was played from existing games." And then Murray gives the rules of existing games Saturankam, etc., all on odd-square boards. So, 38 years later, his belief has become a certainty! Murray gave us no indication to support this transformation. The only reference he gave was his own book from 1913! Apparently, Murray had no new element. Finally, all known representations of 8x8 cross-cut Chess-boards are rather recent and nothing proves that the Ashatapada board was cross-cut at all. The first mention of special squares on the Ashtapada board is found in Manasollasa written about 1110 by the South Indian ruler Somesvara. It is the first description of Chess (2 and 4 Handed) in South India and it describes "house" cells (cross-cut ?) on Ashtapada board. There is doubt that Ashtapada was a board for a dice game between 300 BC. and 500 AD. However, no extant text mentions any use of any kind of pawn or piece and nothing proves that those boards had cross-cut squares like modern Indian Chess board. It has been suggested that the game was a kind of lottery. Why not? Strictly speaking, nobody knows what kind of games was played over the Ashatapada. Such a circular path will make a race game for 2 to 4 players with 52 stations. Let's just observe that circular race game exist in several places in Asia, (Yut in Korea, Sho in Tibet) and Precolombian America (ex: Zohn Ahl, some Patolli). Some elements let us think that Chinese Liubo could have presented similar features. That kind of race is also intersting because it makes think of other Indian race games like Pachisi and Chaupur. There is also another idea which dwells my brain : the disposal of the cross-cut cells over the Ashtapada board makes me think about ... Liubo ! The Ashtapada board has been seen as a possible receiver for the very first Indian Chess. On its side, the Liubo board has been considered to have had some influence of the creation of Xiangqi, the Chinese Chess. Chess and Xiangqi are undoubtelly related because they share many common features. If Ashtapada and Liubo were connected as well, the whole story could have been much more complicated that we even think so far ! All this desserves more studies! Retrouvez l'Ashtapada dans "Du Senet au Backgammon ; les jeux de parcours"
Reference : Andreas BOCK-RAMING, « The Gaming Board in Indian Chess and Related Board Games : a terminological investigation », Board Games Studies, n°2, 1999.